There are hundreds of handmade gift box ideas on Pinterest. Trust me. I’ve looked at them all, I think. Today’s handmade gift box is specifically for giving to a hostess for your next halloween party, card party, Christmas event, whatever event. Take something to the person. I have a list of things below that will fit in these boxes. All the items make great gifts and if you are going to someones event, you could package a little goody in this box perfectly. 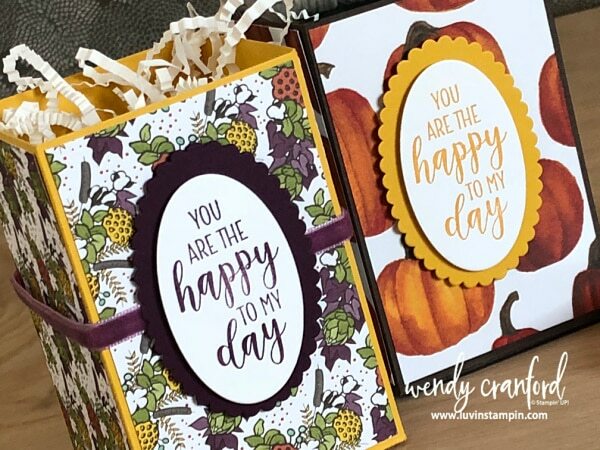 I gave the one with pumpkins on it to my friend Wendy. She hosted a workshop in her awesome barn this past weekend and I wanted to bring her a little treat. 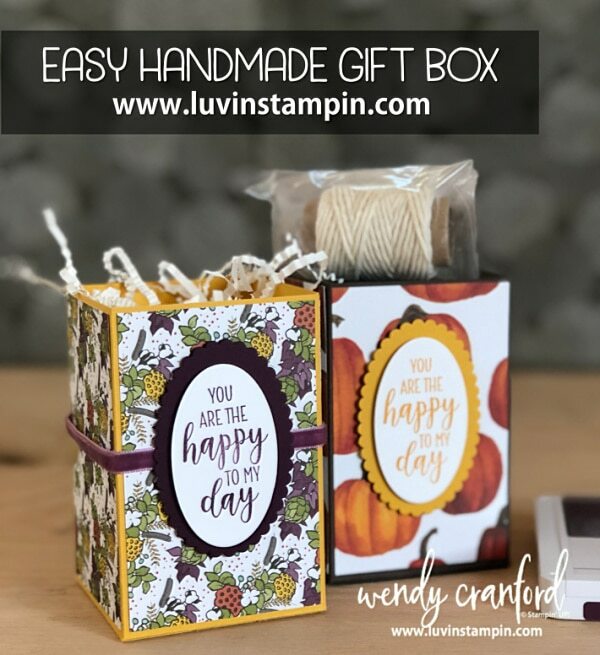 The Festive Farmhouse twine fits great in one of these boxes and is the perfect gift for a crafty friend. The list could go on and on, but hopefully that small list will get you started. If you are a visual learner like myself, a video is always helpful. So I’ve done just that. Hope you enjoy. Make sure to read below the video for a list of supplies and the tips and instructions for this box. + Score on the short side (6 5/8″ side) at 2 5/8″ (this makes the bottom of the box. + Fold on all score lines. Trim in on bottom pieces to the bottom scoreline. Add tear and tape to the 1/2″ tab to close box. Fold bottom tabs in to make bottom of box. Such a cute box and was very easy to make! I’m not a fan of this DSP, so I used a retired one. Just wanted to say THANK YOU for sharing! I really like this box. I can make a few to keep on my crafting area or desk. Again, TFS!